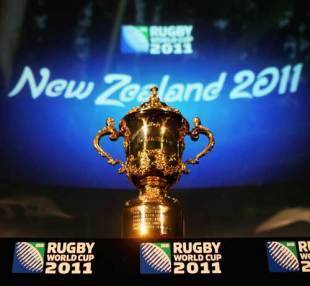 The 2011 Rugby World Cup is the seventh Rugby World Cup, a quadrennial international rugby union competition inaugurated in 1987. The International Rugby Board (IRB) selected New Zealand as the host country in preference to Japan and South Africa at a meeting in Dublin on 17 November 2005. The IRB Council eliminated South Africa in the first of two rounds of voting. It is the largest sporting event ever held in New Zealand, eclipsing the 1987 Rugby World C, 1990 Commonwealth Games, 1992 Cricket World Cup, 2003 America's Cup and 2005 British and Irish Lions tour to New Zealand he organisers expect 95,000 visitors from overseas to travel to New Zealand for the event. The schedule of games runs over seven weeks starting on 9 September 2011. The final will be played on Sunday 23 October 2011, a date chosen because it falls on a long weekend caused by the New Zealand public holiday of Labour Day (Monday, 24 October 2011).The final is scheduled to be played in Auckland at Eden Park. After speculation that the number of participating teams would be reduced to 16, the IRB announced on 30 November 2007 that the 2011 tournament would again feature 20 teams. Twelve teams qualified as a result of finishing in the top three in each pool in the 2007 tournament. The remaining eight berths were determined by regional qualifying tournaments.Of the 20 countries that competed in the previous World Cup in 2007, there was only one change – Russia replaced Portugal.